NEW MANCHESTER — The Oak Glen boys basketball team opened the season like a bunch of angry, caged bears running and gunning its way to an 81-57 win over Hancock County-rival Weir High inside the Oak Glen Fieldhouse Tuesday night. The Golden Bears unleashed a first-half offensive attack that buried the Red Riders early. It was a hole that coach Mike Granato’s out-manned club could not dig its way out of. Weir High was without two key players, and Granato started three others who only had six practices because of playing on the Red Rider football team that went all the way to the semifinal round of the postseason. 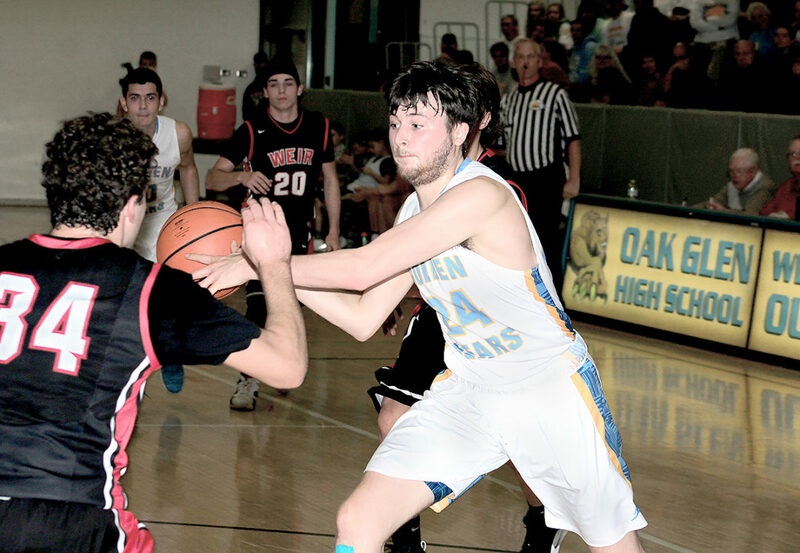 Oak Glen’s three-year starting center, Ethan Travis, was on fire coming out of the locker room. The 6-foot-4 senior scored his team’s first eight points and finished with a double-double (19 points and 11 rebounds). “He led the way, and everyone else got into it,” Everly said. “We had four guys in double figures, and everyone played well. Everly’s anxiety eased quickly, as his club ran out to a 26-7 first quarter lead and led 46-26 at the half. Granato’s team, though, settled down at halftime and opened with a 7-0 run to cut the Oak Glen lead down to 13 points, but it didn’t have the firepower to keep it going. Junior Tanner Mikula led the Red Rider offense with 15 points, including the team’s only two made 3-pointers. Another junior, Dakota Nutter, came off the bench to score 10 points. The Golden Bears play again next Tuesday, hosting Brooke. 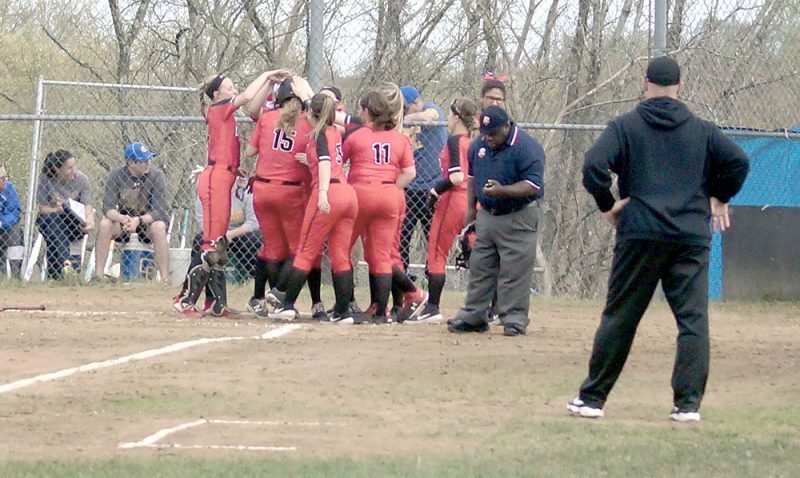 The Red Riders get right back into action Friday at Indian Creek. ¯ The Red Rider junior varsity squad defeated Oak Glen, 61-54. Tyler Kelly led Weir High with 16 points. Konner Allison led the Golden Bears with 15. WEIR HIGH (0-1): Haught 2 1-2 9, Trupiano 0 1-3-1, McCoy 2 0-0 4, R. Reitter 3 0-0 6, Mikula 6 1-3 15, Buffington 1 3-4 5, Nutter 5 0-4 10, Gillette 2 3-4 7. TOTALS: 21, 13-26: 57. 3-POINTERS: 2 (Mikula 2); REBOUNDS: 31 (R. Reitter 8, Mikula 8); TURNOVERS: 18. OAK GLEN (1-0): Wiley 1 2-2 4, Perez 2 0-0 4, Smith 4 0-0 8, Patterson 4 3-6 11, Gittings 3 5-7 12, Travis 6 5-8 19, Clark 2 0-0 4, Taylor 6 2-2 16, Mineard 2 0-1 3. TOTALS: 30, 16-26: 81. 3-POINTERS: 5 (Taylor 2, Travis 2, Gittings); REBOUNDS: 29 (Travis 11): TURNOVERS: 10.